Yamanaka Sawao, Sato Shinichirou, and Yoshiaki Manabe combinine the influences of The Jam, The Clash, and Bob Marley (to name a few of their professed favorites), in their label-defying band called the pillows. The deliberately lower-case name is but a taste of the band's uniqueness, backed up by a diverse sound base and distinct lyrics which speak for themselves. Between their genesis in 1989 and the production of the hallmark "Please Mr. Lostman" in 1997, the pillows experimented with image and style as well as the makeup of their band. 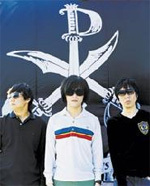 Founder Kenji Ueda left the pillows shortly after their first full album entitled "Moon Gold" was released, in order to become the full-time producer of his own record company called Delicious Label. Vocalist and guitarist Yamanaka, drummer Sato, and guitarist Yoshiaki nevertheless remained at its core while the band saw some honorary members come and go. Jun Suzuki currently plays support bass. The pillows signed onto King Records and produced "Kool Spice" in 1994, presaging the release of the launch-pad album "Please Mr. Lostman". That album marked the development of the signature pillows sound that fans would come to recognize. Their trademark icon, a doglike teddybear named Buster, was soon to follow the realization of their sound. The unusual fanged creature spotted in a toy store window in London during a tour also lends its name to fans of the pillows, affectionately called 'Little Busters.' Their 1998 album "Little Busters" including the identically titled song memorialized the iconographic addition to the band. The pillows came into the western spotlight only with the release of the eccentric and entertaining anime "Furi Kuri", often abbreviated as simply FLCL, sometimes pronounced and spelled as 'Fooly Cooly'. The entire soundtrack was comprised of pillows hits and singles, featuring a few new songs specially written for the anime release. Many of the more recognizable songs, notably "Crazy Sunshine", "Last Dinosaur", and "Carnival" are from their 1999 album "Happy Bivouac". The FLCL soundtrack did well in showcasing the diverse sound that the pillows are capable of producing. The cheerful "Crazy Sunshine", "Last Dinosaur", and "Ride On Shooting Star" presents an upbeat, optimistic sound, while many of the instrumental pieces such as "Sleepy Head" and "Come Down" offer a harder rock edge. "Advice" combines the band's grittier possibilities with unabashedly unplugged vocals, while "One Life" and "Hybrid Rainbow" hold a more laid-back pace. Even though all three core members have experimented with side projects and other bands, the pillows remains strong and well-loved, having just celebrated their fifteenth anniversary in 2004. They released three albums that year; "Turn Back", "Synchronized Rockers", and "Good Dreams". The very next year, the pillows appeared in America for their Delicious Bump tour which kicked off at the the South by Southwest Festival in Austin Texas, then went through New York, Chicago, San Francisco, and Los Angeles. The pillows were reported as pleasantly surprised at the incredible support of their American fans, and encouraged audiences to explore the music produced before the anime FLCL which had both typified and introduced their sound to the west. 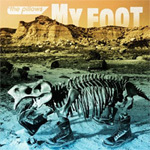 After their American tour, they released the album "My Foot" in January of 2006.